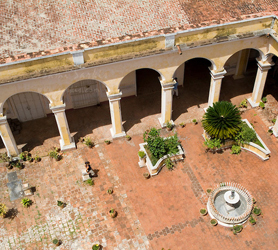 Museum of Colonial Architecture in Trinidad displays architectural and interior decorating details from the periods of the 18th and 19th centuries, and has a pretty patio garden for visitors to relax and soak in the quiet surroundings. Both in the interior of the museum and in the beautiful courtyard of the ancient building, visitors can admire displays of the architectonic development of Trinidad over almost two centuries, including a beautiful variety of decorative and wooden window bars among other highly valuable objects from the historical and patrimonial archives. The Museum of Architecture lets you explore Trinidad’s progress from its first settlement through the Cuban revolutionary times and on into present day.